Three. It is the natural number following two, and preceding four. It also represents the three of us, the memories; of the fun, joy and laughter that we shared throughout the years. No, although we didn’t meet frequently, but somehow our conservation always continue smoothly from the previous meeting which was a few months ago, as though we just met yesterday. 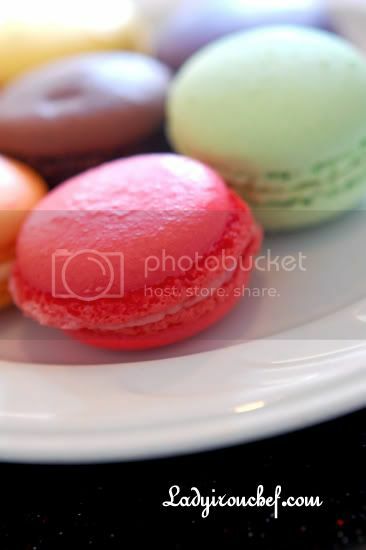 Friends, are like the macarons you see. They come in all shapes and flavours, just like friends who has different characters and personality. And how long have we all known each other; with each finger representing a year, I count almost nine out of the ten fingers I could afford on both of my hands. Friends. There isn’t a need to contact with each other all the time. A simple greeting, uncomplicated chit-chats, and a sincere well-wishes, are the ingredients needed, just like how a good macaron is defined by having chewy shells, with flavourful fillings. Friends, we automatically updated and filled in on each others life, the gossips and chit-chats that make a whole afternoon passed by in a blink of the eye. 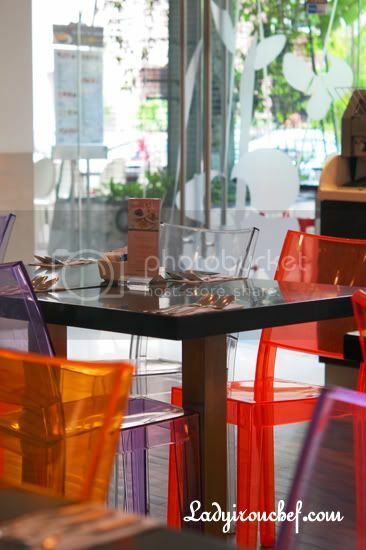 A place to sit, some desserts to go along with a cup of tea, are all we need. She giggled, you chuckled, and we smiled. Much as we used to complain about dragging ourselves out of bed on a Saturday morning just for the practice, thinking of the silly times we had, those were the days. All of us had moved on, to new pasture, and a different world. But we still managed to meet up even though the rest often had excuses to miss our gatherings. Yes, always the three of us. 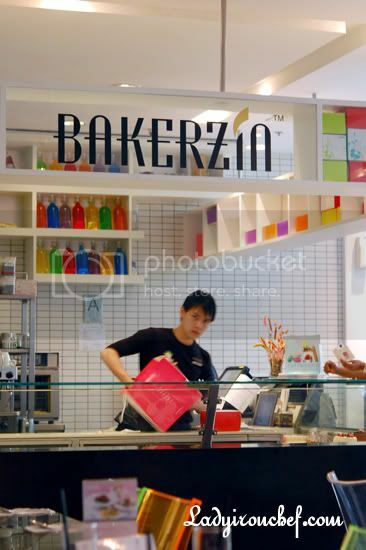 Bakerzin is currently having their Macarons promotions, selling at a dollar for each macaron (usual price $1.60++). And since it is a promotion, their usual flavours will not available, instead there’s ten different flavours to choose from. We had seven out of the ten, namely; lemon, coffee, Peach, Pistachio, Sakura, Blueberry, and Chocolate. In short, not all the macarons impressed. We like the coffee, with the strong after-taste lingering on our tongue. The pistachio was chewy and sticky. The first bite of the chocolate was overwhelming bitter, but the taste became sweeter for the second bite. 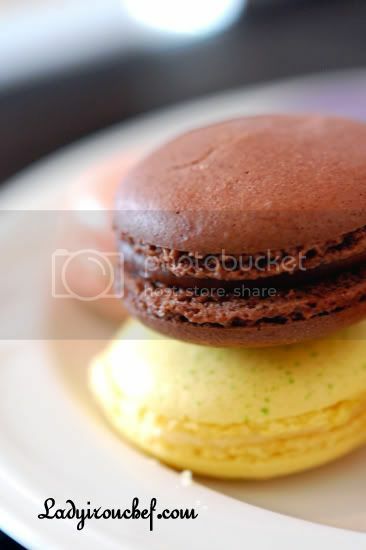 The different macarons have different texture, the lemon and the blueberry’s shell crumbled easily, while pistachio and chocolate have slightly crispy ones. But still, a dollar a macaron is cheap, and you can’t complain. I was sceptical about choosing the Mango mousse ($6.20) initially. But since I’ve try most of the other cakes available at Bakerzin, we decided to take a risk and go ahead with it. And I must say the mango cake, or rather mousse was better than what we thought. 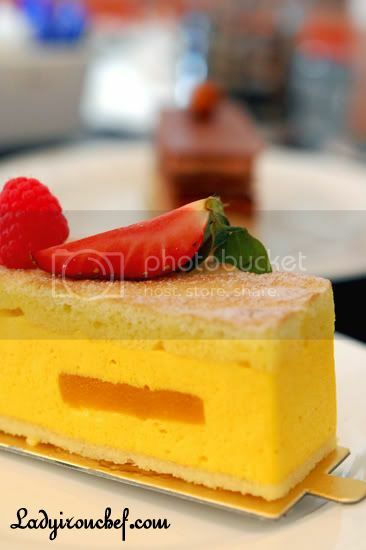 Two layers of thin sponge with thick layer of mango mousse in between. The mango mousse, was naturally fulsome with mango. With a name like Lavande ($6.90), we were perhaps expecting something more of the lavender flower, but it never came. Instead, the cake was very rich, with the goodness of dark chocolate fudge, and the velvety lavender-infused chocolate mousse. The very subtle lavender flavour in the cake meant that it was simply a chocolate cake, with a slight hint of flower. As with most tastings, we always leave the strongest for the last. Sweet Pleasure ($6.90) is what my friend call it, my-kind-of-cake. How very true. 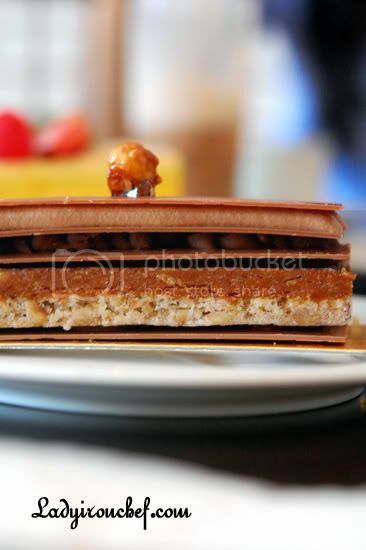 A top layer of chocolate, jivara milk chocolate ganache, a layer of chocolate mousse, and hazelnut praline dacquoise. All in all, it did seem like a ferrero rocher cake. And having tried about thirteen of Bakerzin’s cake so far, sweet pleasure together with the chocolate amer are two of my favourites. Friends are one of the nicest things you can have, and one of the best things you can be. One year technically isn’t very long, and with the advancement in technology, there’s always msn and email to bridge the gap of the two countries. Have fun in the coming months, my friend, my senior, my big sister. The three of us, yes as always, three, will meet once you got back. Total Bill was $37.25 for 3 cakes, 7 macarons, and 3 drinks. With the promotion of getting a drink at $1.90 each with the purchase of each slice of cake during tea time. As you will know by now, I don’t like to repeat visits, but the one-dollar a macaron was too tempting for me to resist. Having tried thirteen cakes on two visits, it is unlikely that i will visit Bakerzin in the near future, but yeah, you shouldn’t missed their current promotion until end of Feburary. i told you that the sweet pleasures was so ‘your-kind-of-cake!’ too! haha. kudos to me! hehe. Glad you enjoyed it too! Ah…i was almost in hysteria when I saw Lavande on display here! fen: haha it was totally sweet. but i think the lavender taste wasn’t strong enough too. hmm, my friends preferred the coffee flavour, i thought everything was all right only, no particular favourites. 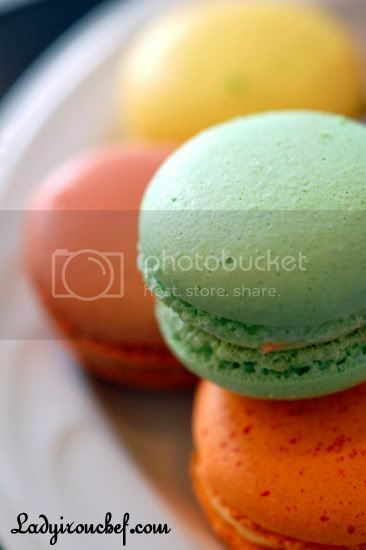 those macarons looks divine. and at a dollar each – a STEAL! i miss bakerzin. and sweet pleasure was definitely my favourite when bakerzin was still in m’sia. wow lovely! I want lots of macarons and loads of freidns! big boys oven: hahahahaha yeah macarons are nice right! Any good ones to recommend from your side? I missed their Tiramisu. It’s the best that I ever have. Unfortunately they have closed the Penang branch already. Sad Sad Sad …. New Kid On The Blogs last blog post..Hoong Tho Restaurant ???? New Kid on the blog: haha when did they close down the Penang branch? Is bakerzin still available in Malaysia? i tried the macarons but didnt like them. lols. qiugui, i’ve been to cafe pralet recently. 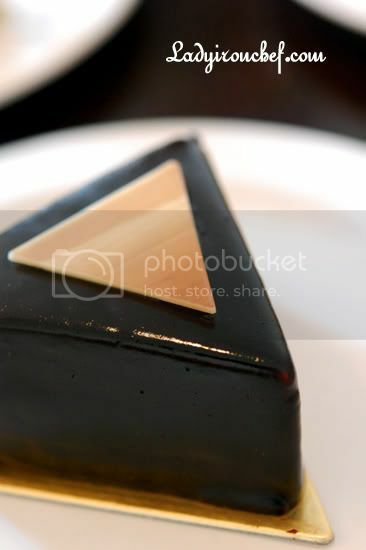 e Pralet cake is not bad, taste like four leaves cake. with the rocher type of base, if u know what i’m talking abt. lols. but the mains are not that good. yea cos i work nearby. it’s somewhere opp link hotel (u’ve been to persimmons right?). i posted e photos in my LJ. 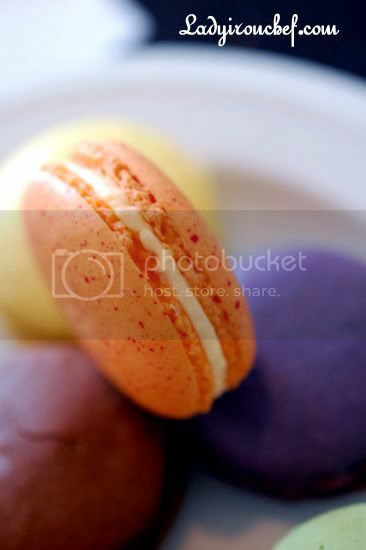 & does macarons taste liddat? like cough syrup. yucks. it’s kinda my time with macarons. 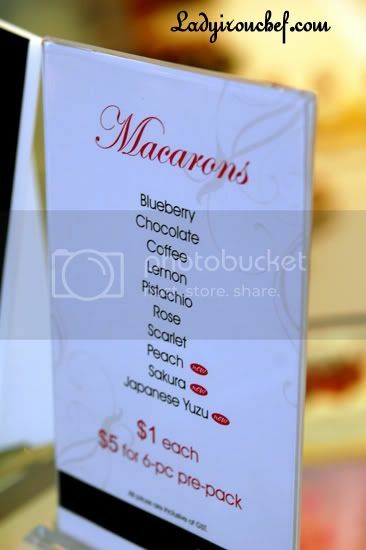 zay: aiyoh cos you haven try the nice macarons! 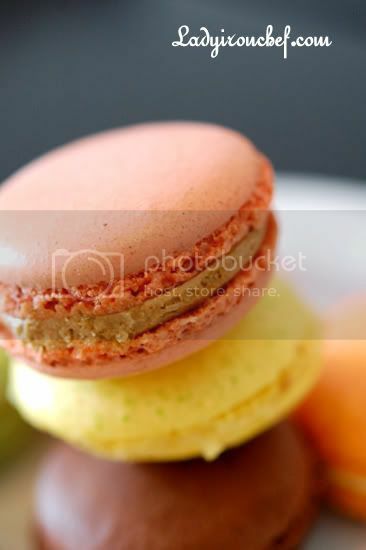 please dont let one bad macaron spoilt your impression of them. hi there! i love this bakerzin at millenia walk too! it’s just the perfect place for a cozy get-together with your beloved friends. the bright and cheery decor speak for itself. i like it that it’s not too crowded and tucked away in a little corner, away from the prying eyes of the passer-bys. you also take great pics.. wondering what camera you are using? thanks and cheers to food writing! Hi. I love macarons. This is very tempting. Do you know if this is Halal or not? Is Bakerzin Halal ?? Because I reaaaally wanna try it .